Today, i’m just gona show more pic then do the talking. Partly because I’m having a sore throat.. (ehem.. *clear throat*) haha! NAH! I’m just being lazy!! but its true that im having a sore throat! too much CNY goodie over the weekend! 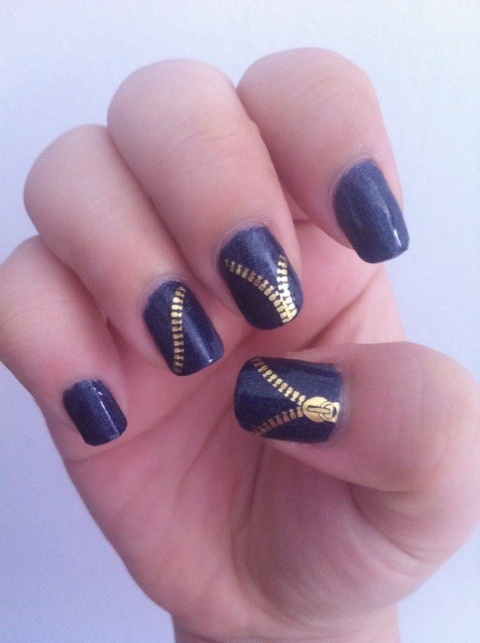 So what’s today nail art?? Ah-ha~! 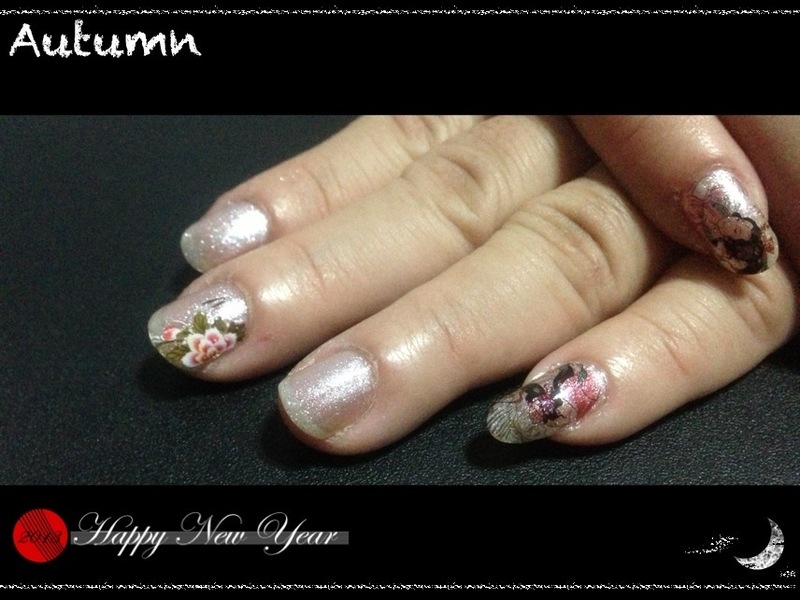 its Ancient Woman~ Did this on my mom to prepare her (nails) for CNY celebration!!! 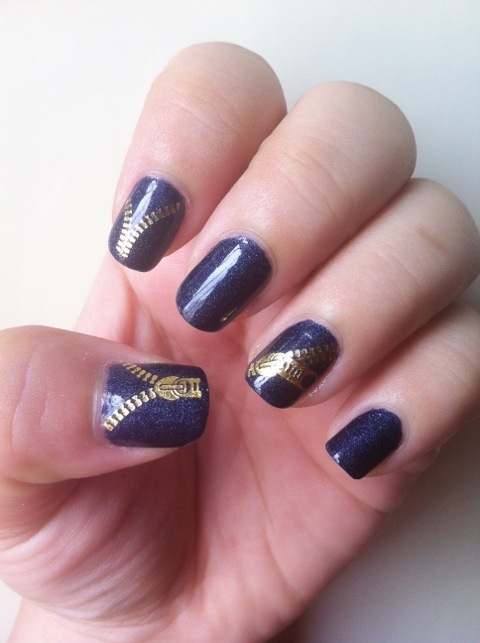 i used 3 coats of A-England Morgan Le Fay and water decal i bought from Mei Mei Signature.. all was pretty easier and nothing new..
Love her nails… but love my mom even MORE! look at her cuticles.. sign of love for us! Few days back i bought a water decal from Qoo10! wow.. it was hell cheap!! only a dollar plus? definitely less than $2!!! Now it makes me wonder what’s the difference between this and those i bought from meimeisignature which is selling at S$3.50! I must be crazy to buy from meimei again if this works out fine!! I WAS sooo happy until i attempted to use it..
Other than cheap, this water decal is nothing good! WHY?? read on! When two ends touched each other, its so difficult to make them apart! 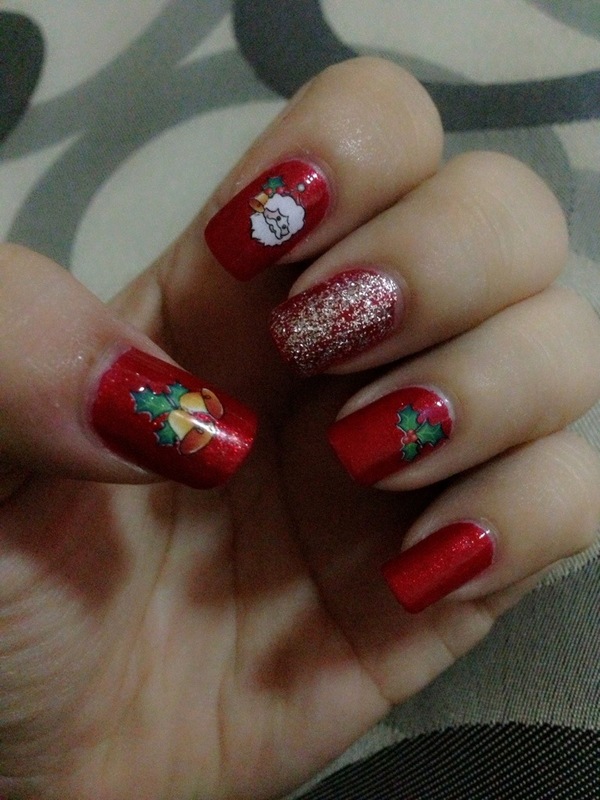 This decal is not like thosel i bought from meimei whereby i can easily position it anywhere i want as long as my nails are wet! This cheap decal basically stick on once it touches your nails unless u dip your whole finger into the bowl/cup of water while positioning it!! (so dumb right!?) by then i think u might have crumpled fingers. This decal will LAK SEK (color will run)! When u apply top coat over it, dun go over and over and over again, u will soon realise ur santa has shaved his beard!!! Mei Mei !!! i was wrong about your decal! 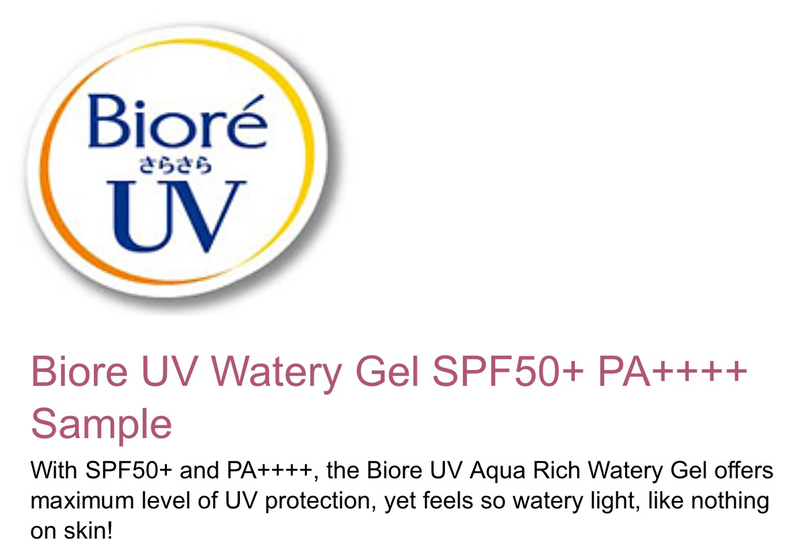 Though they are more costly, still affordable actually, but at least quality is guaranteed!!! 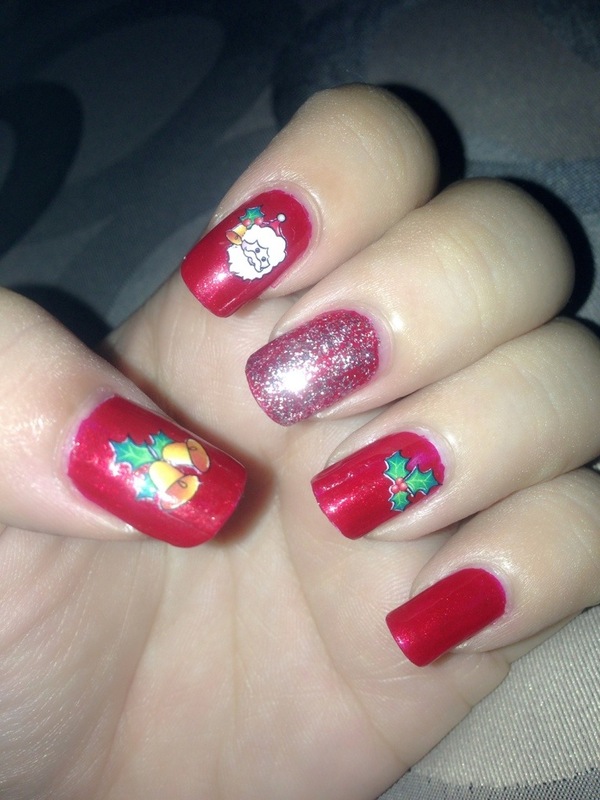 i know every decal will be put in good use when i do my nails! Seriously I’m not gona buy decal from elsewhere but again!! Mei Mei Signature will be my only option for water decal! 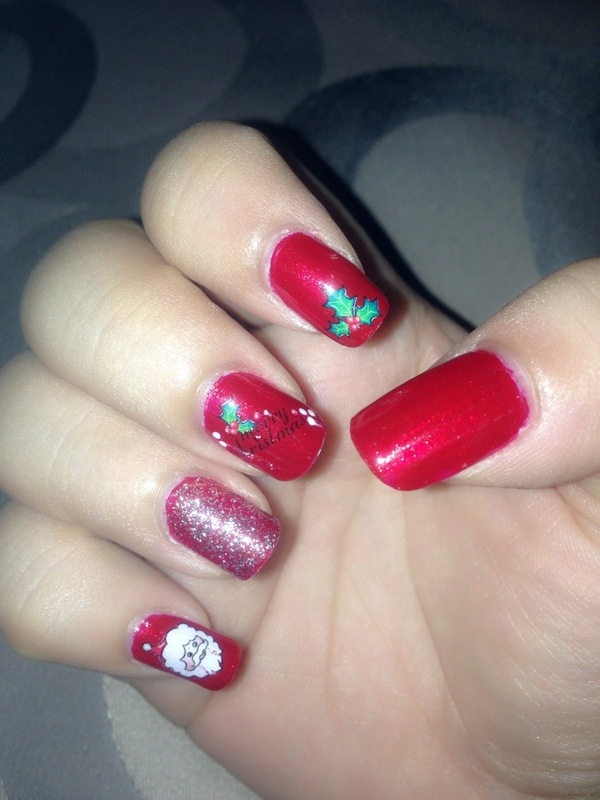 So these are my little red nails for Christmas! 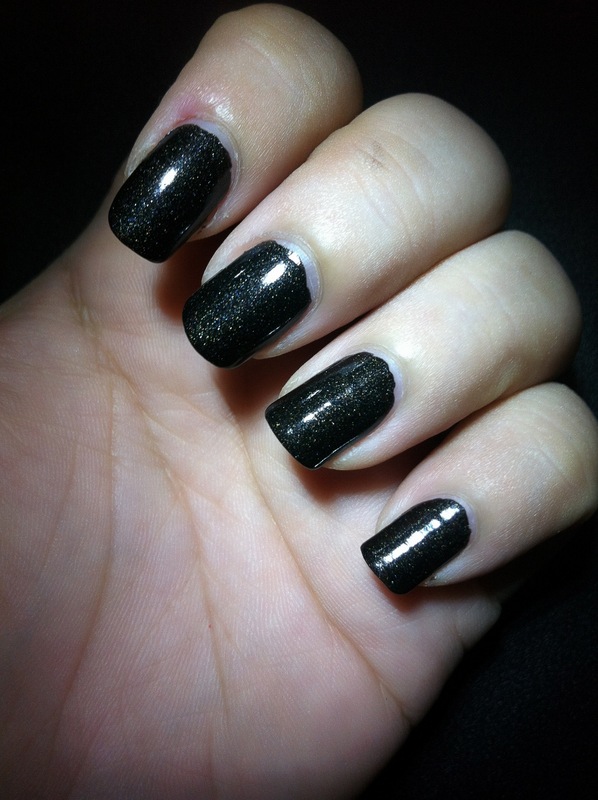 The Spy Who Loved Me from OPI Skyfall 007 collection! I kinda like this red!! very nice and cheery! It’s bright red with gold shimmers. I’m not sure if there are some % of red shimmer but it’s already enough to impress me! 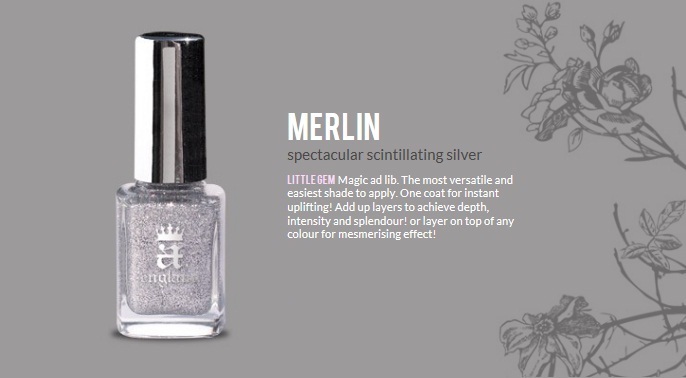 Other than The Spy Who Loved Me, i also used A-England’s Merlin! Silver glitters, glitters with irregular shape i believe! 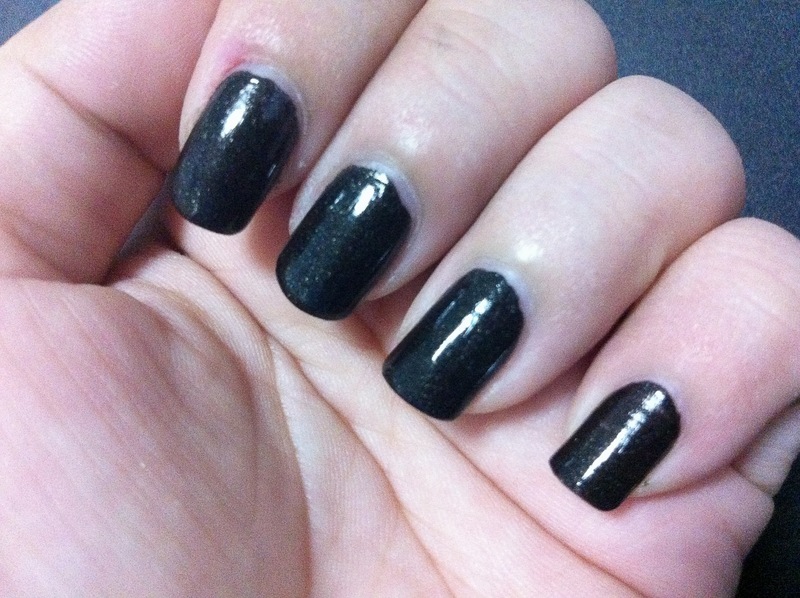 it’s quite “opaque” considering it for a layering top coat. 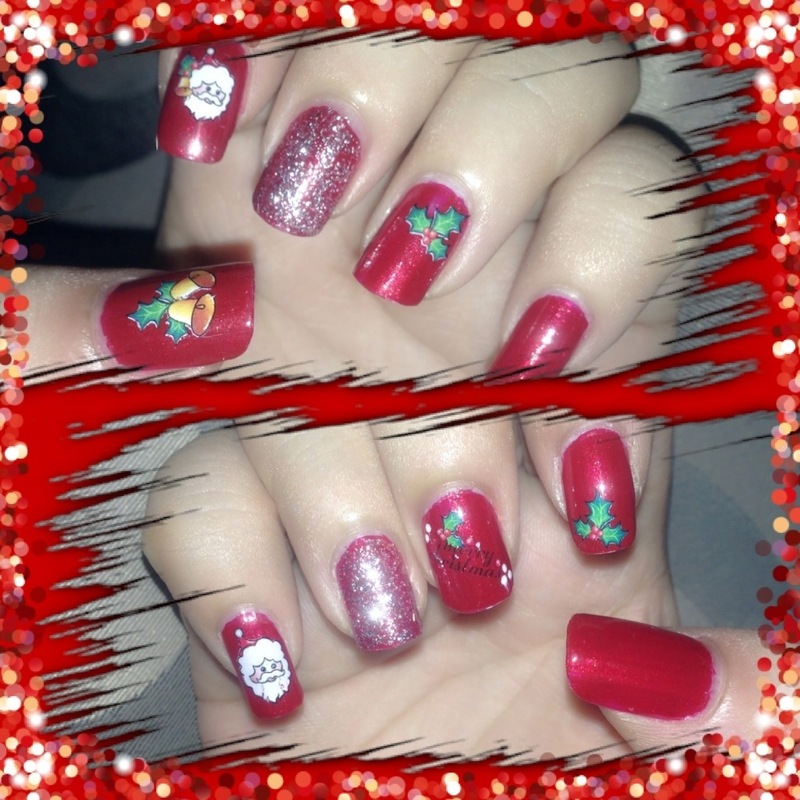 This is just one coat of Merlin with some touch up to the side of the nails..
My poor santa with 2 strends is beard shaved! 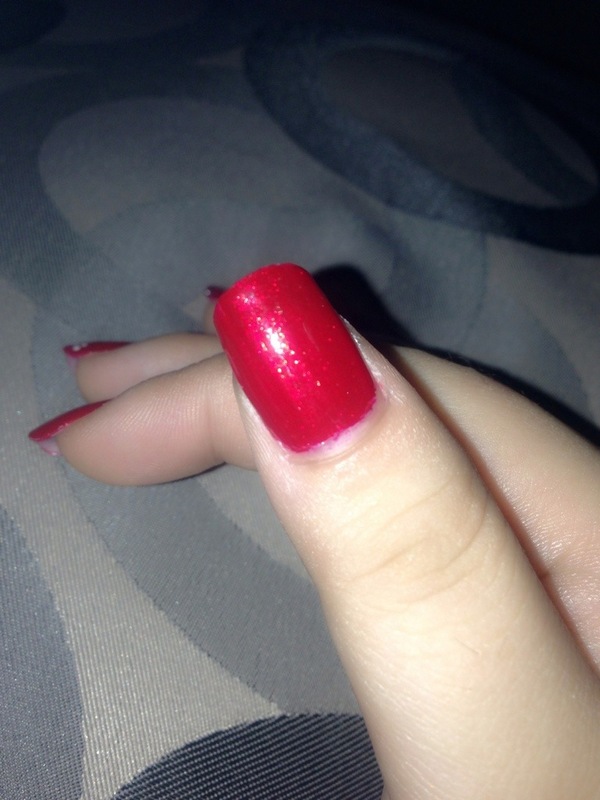 Lucky still able to touch up the red polish..
*without flash* Seche top coat never fails to make me happy! A closer view of the shimmer.. but probably a good camera can do a better job! hahahahaha!! 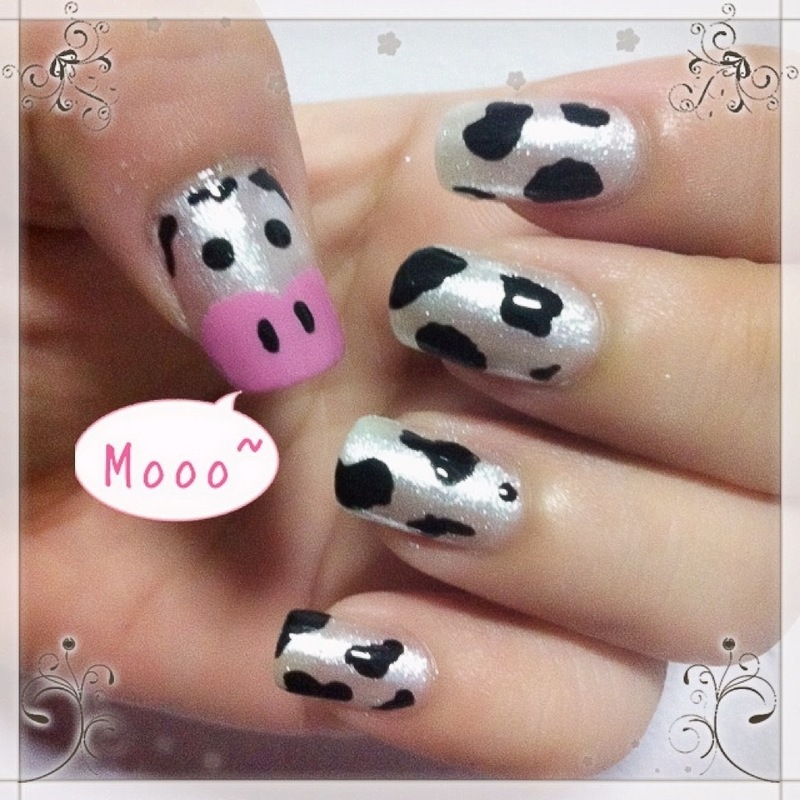 Mooooo~~~ Finally a nail art post!! 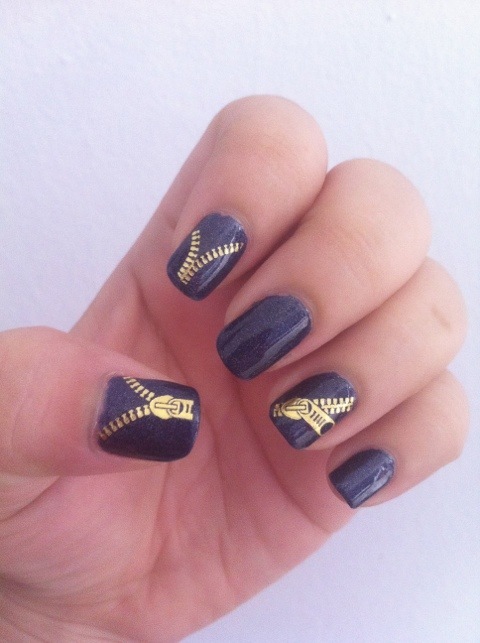 Been wanting to do up a nail art post but haven’t really got time for one.. Too busy at work and too tired to concentrate on painting a good one! It’s always good to look around for inspiration! 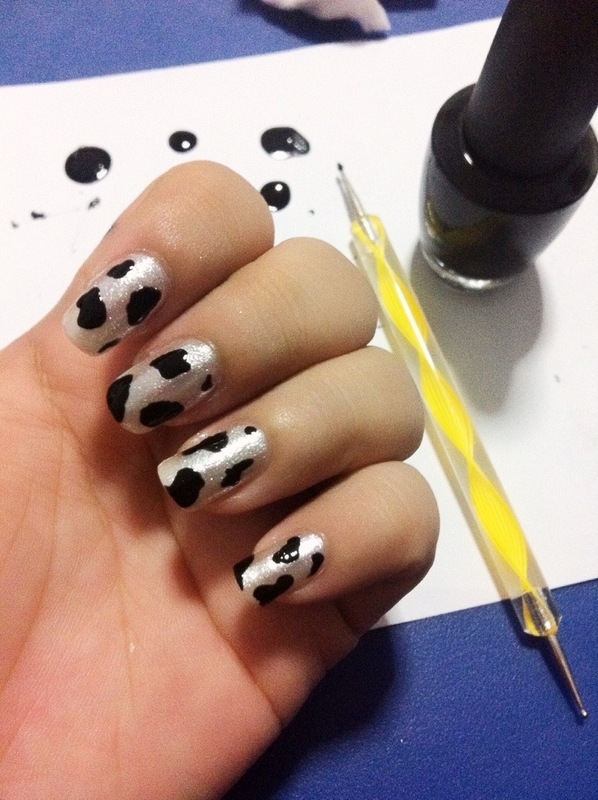 And happen so that I saw this cow art on YouTube and Instagram! So I decide to combine both into one and do it my way!!! Below is the one i saw on Instagram – by posh_n_sparkle. I’m not too sure if it is 100% by her because “rumour” has it that she steals other’s pic.. quite a few of her pic actually belongs to another person and mostly by @youngwildandpolished!! Shall share with you more about this next time. 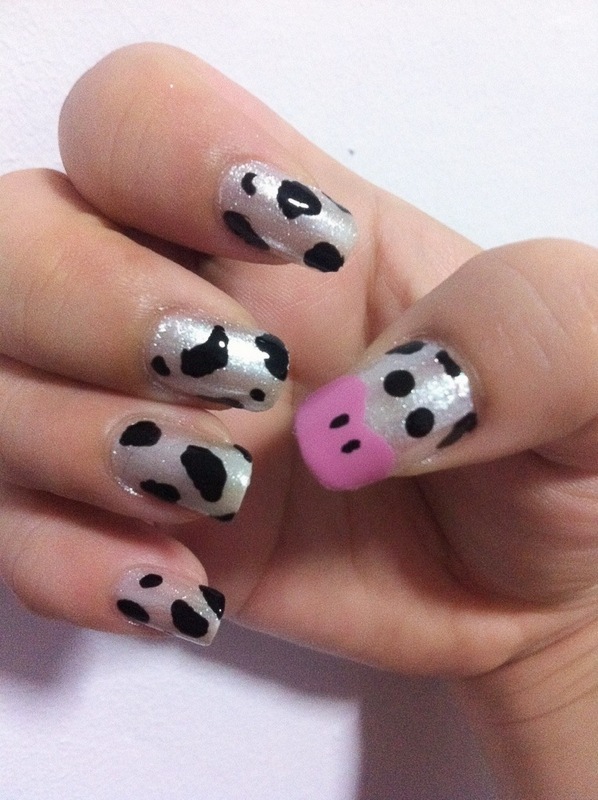 Below is what i found on YouTube.. A cow nail art by Creativenailart! You can visit her BLOG to see MORE tooooo! Both are so nice right?? Well after “studing” both, i did a SMALL revision of it and came up with my own Moo Moo Art! So first of all…… Base coat! 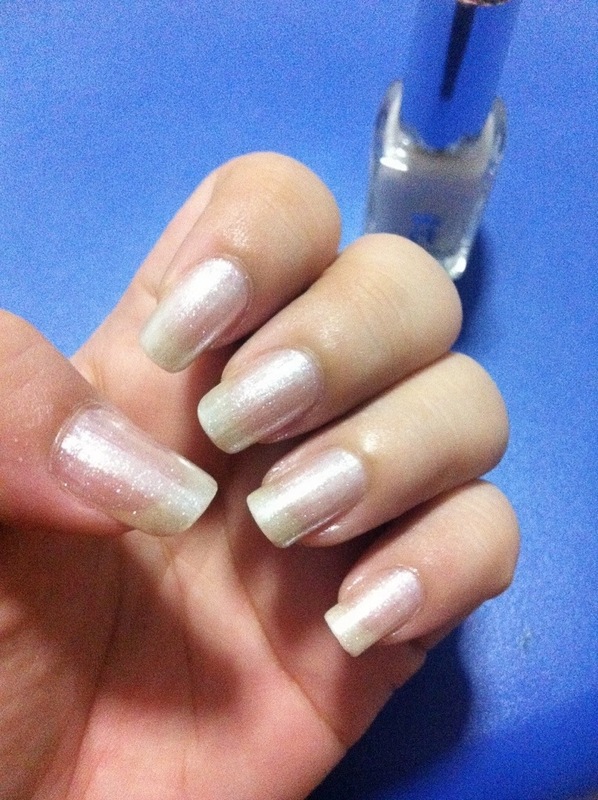 The base coat I use here is by Seche! Ridge filling base coat.. It gives a sheer pearl white appearance.. Sorry that I din get to picture it but u can try “visualizing” it with below pic..! Hee!! Next, the cow patch!! This is easier then leopard prints IMO! I just grabbed my dotting tool & black onyx and started drawing the patches..! 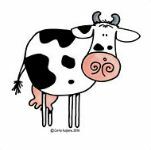 But do note that, unlike leopard or zebra, cow prints are more of big irregular “round” patch. 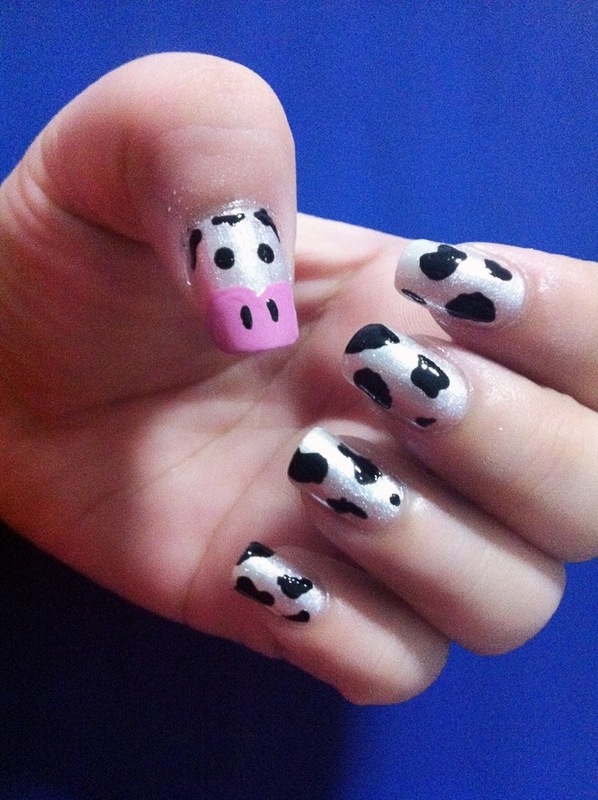 If u din paint it as “round” patch, your cow might turn out looking like something else…. erm, don’t get it?? Nevermind, see below pic and tell me, which one looks more like a cow prints??? i think the left side one looks more like cow! 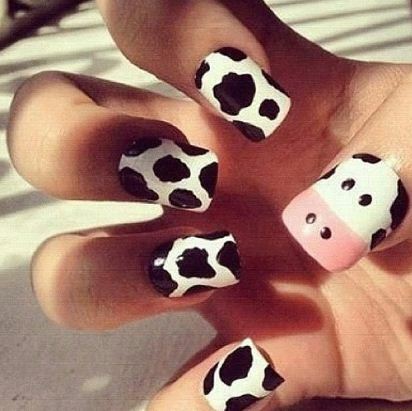 LOL, ok, i know i know.. enough of cow prints debates… !!!.. So here’s my completed patch.. Satisfied! Shall proceed with my moo moo face!! 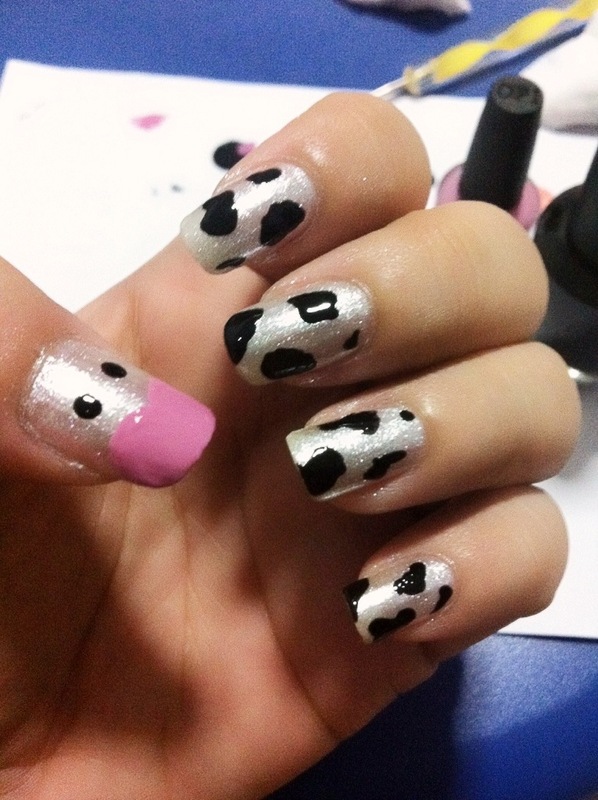 For my moo moo face, i used OPI’s Sparrow Me The Drama. Draw the head of a heart, BIG HEAD and put 2 long dots with ur dotting tool as its nostril! remember to dot ur moo moo eyes!! And now… I’m done with my left hand…! and right hand?? 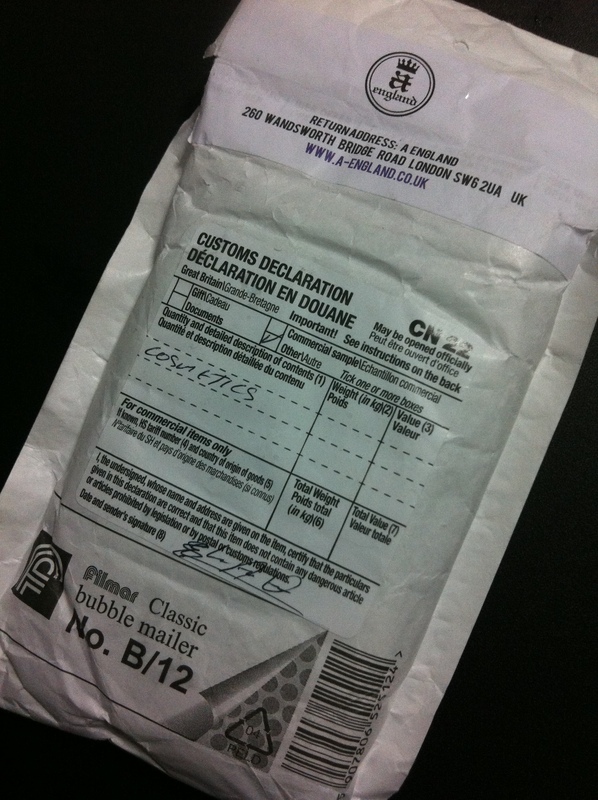 I cant explain the happiness on my face when i see this “envelope”!!! I’m totally crazy~!!!! Yes~!! 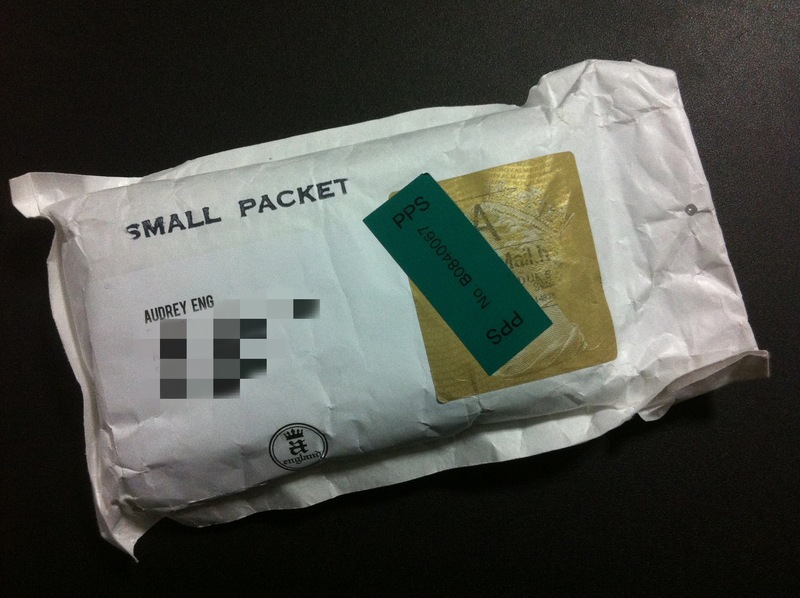 It’s my A-England direct from UK!!!!! 2 weeks.. it took about 2 weeks to come to me~ These are the colors i grabbed during their biggest promo ever! Too bad if you had missed it!! But it’s definitely worth waiting for the next one!!!! 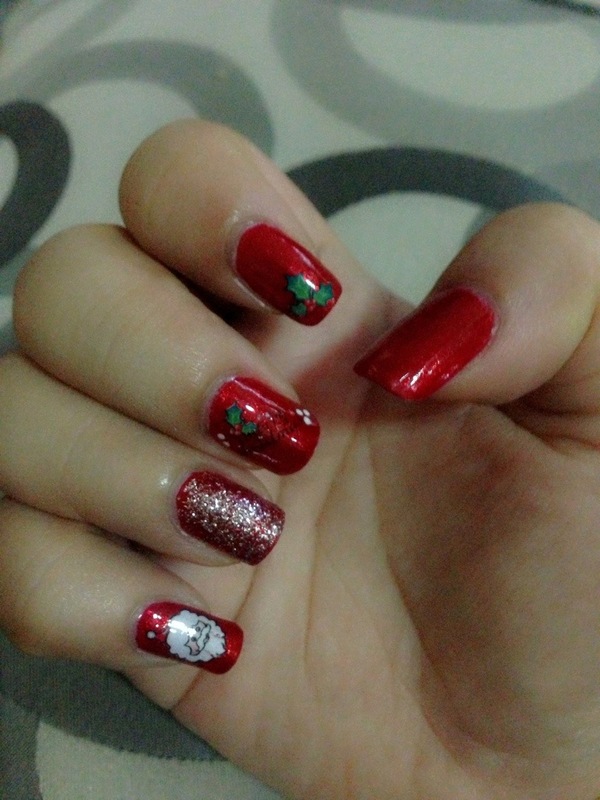 I did a quick job on my mom’s finger and… can u see something not right?? ok probably you cant… see my mom’s index and middle finger?? you would think both are Galahad ya?? NO! actually…. Only index is galahad!! 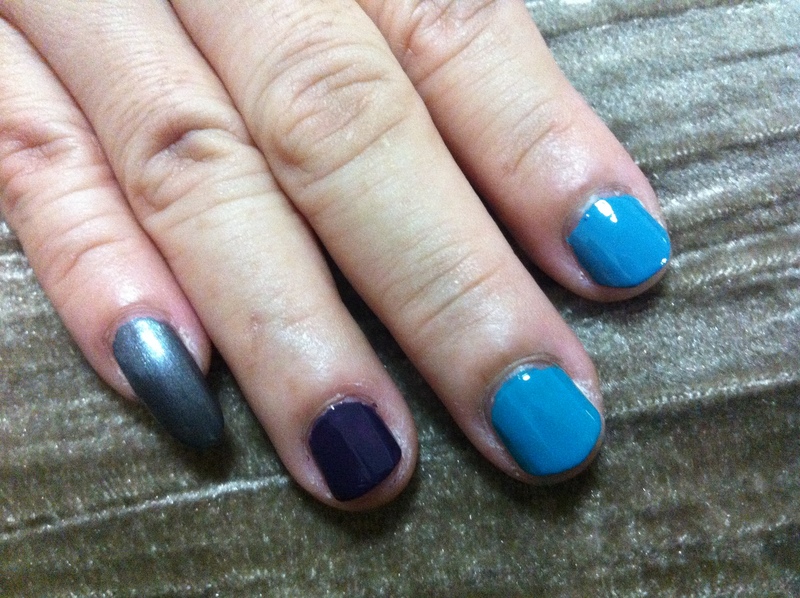 Middle is OPI FLY~~ very similar.. BUT there’s still difference!! 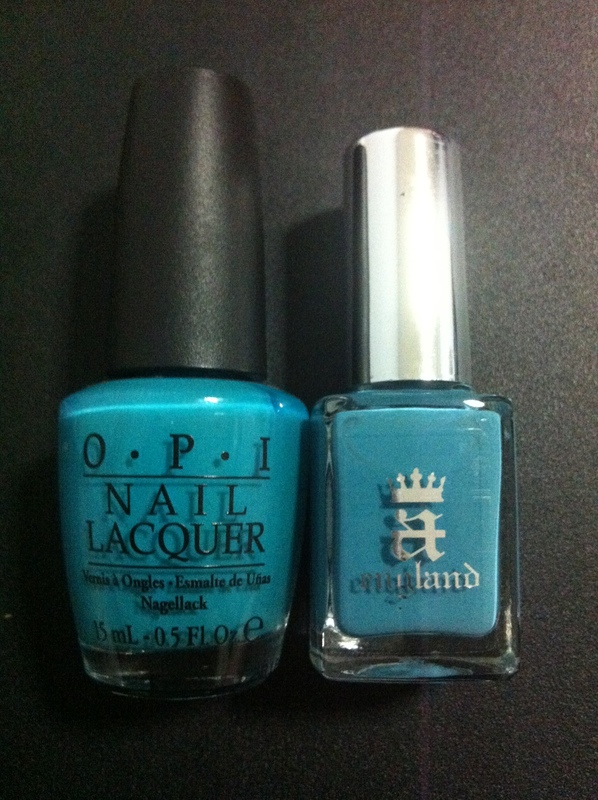 OPI Fly is a brighter green whereas A-England Galahad is creamer milker tone of green.. Fly would need 2 coats to go but Galahad is good to go in just 1 coat~!! I’m really falling for A-England!! What are you waiting for!!!?? 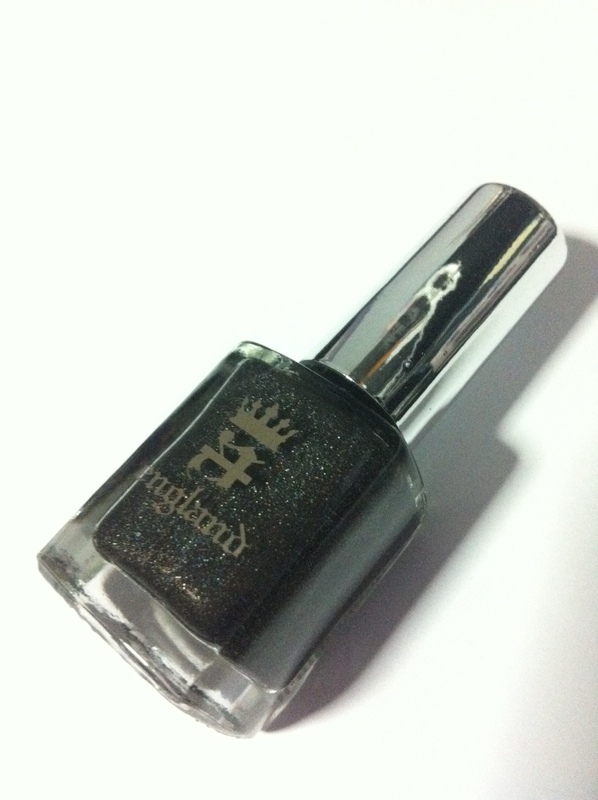 For only £5.00 (approximantely S$10) you can bring home your favourite A-England polish!!! i seriously dono why should i wait further.. HAHAHA!! 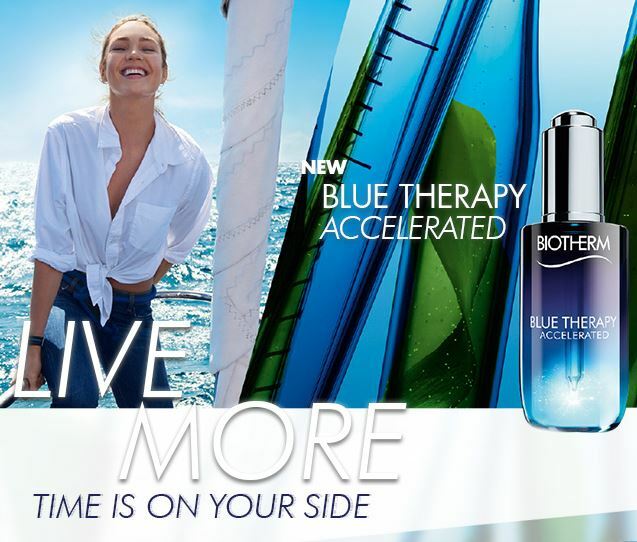 Need some MOTIVATION/ push factor to buy??….. 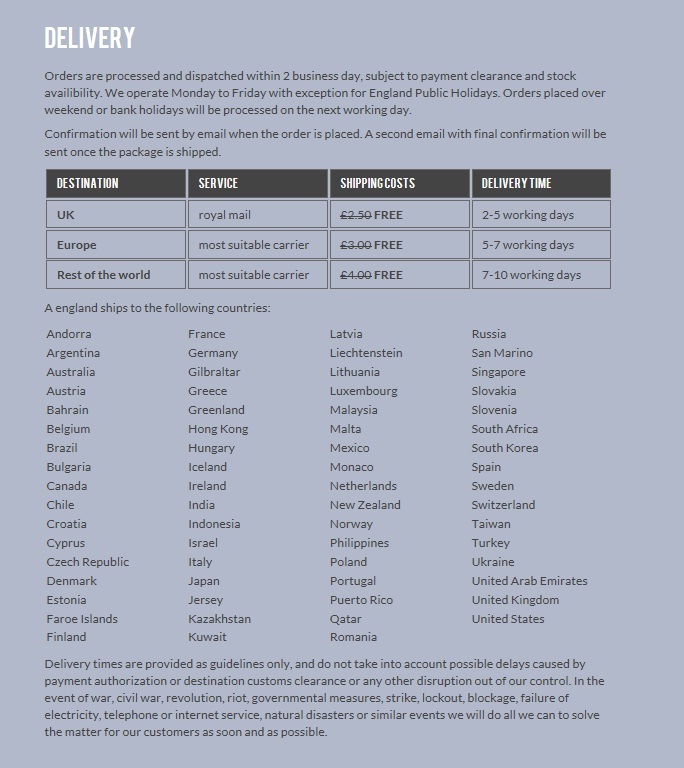 FREE SHIPPINGGGGGG!!!! How’s that????? I already have some A-England colors (Tristam, Perceval, St George & Bridal Veil) and i find these colors very opaque and have very smooth! most colors are good to go with just one coat!! I’m not boosting, really!! So here are the colors that i’m eyeing on…. Good for laying!! Purple..!! a very deep purple! eyeing for this since long long ago!! 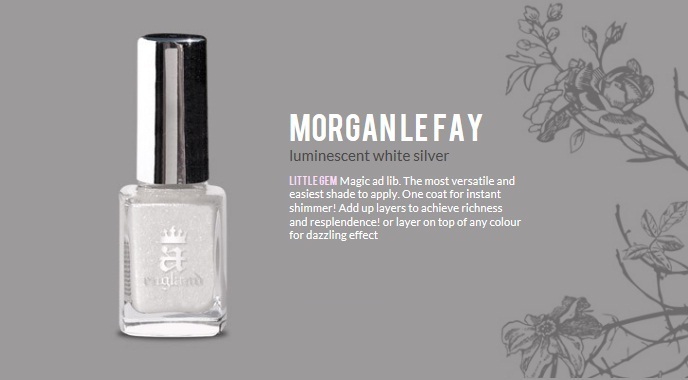 A greyish silver with colorful shimmer, but only visible when u look at it hard enuff!! hahaha!! Well.. what are you waiting for..? head down to A-England NOW before its all out of stock!!!! 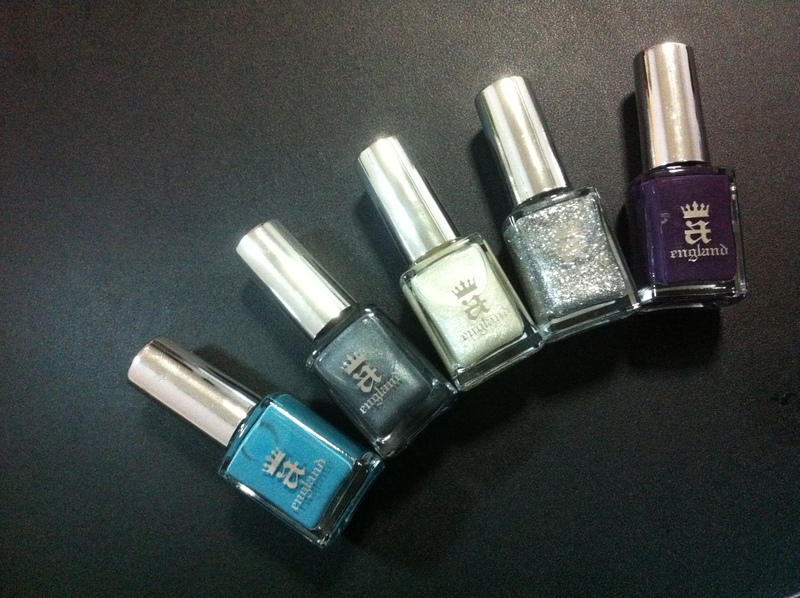 You know i seriously seriously seriously nvr thot that i would bring home one of my favourite polish!! A-England Bridal Veil!!! 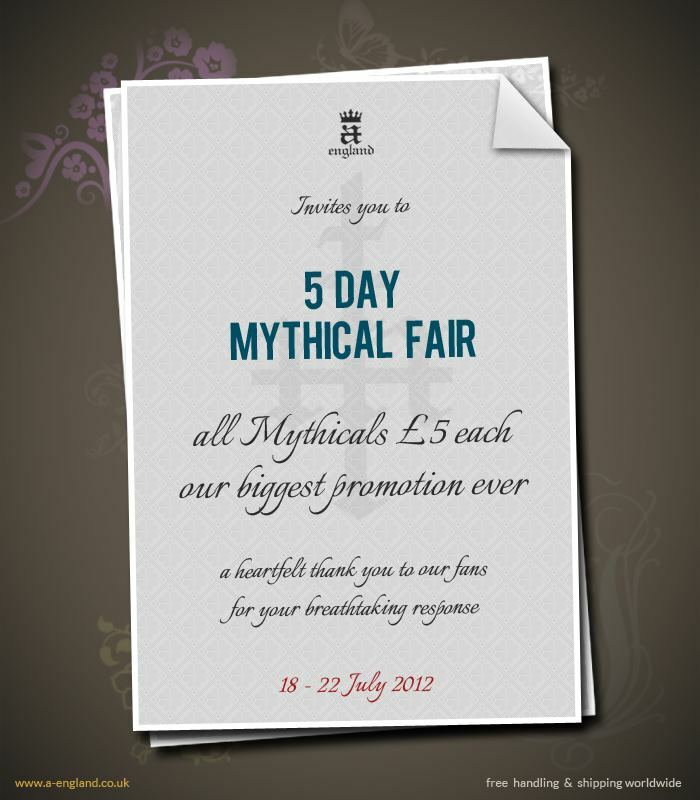 Thanks to Mei Mei’s Signature Mega Giveaway that ended 30th June!! i won myself an A-England Bridal Veil!! 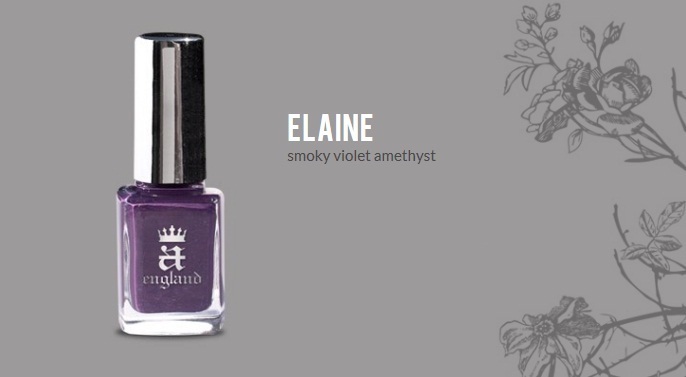 Bridal Veil is not a new color from A-England collection but it’s definitely the latest polish in my stash! To me, Bridal Veil is a very amazing color..! 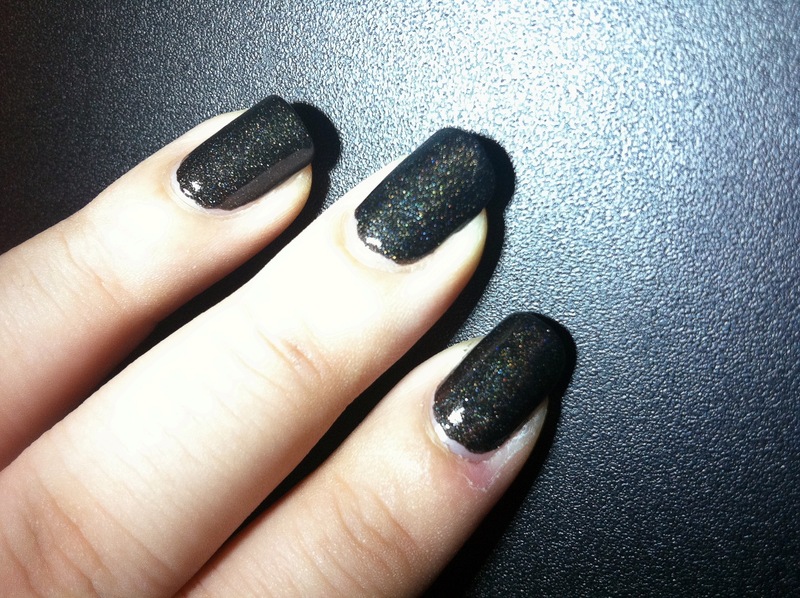 Black but not totally blackest black because it has colourful holo effect under the sun yet like silver glitter when indoor. Pardon the untidy work, i did this in a hurry. 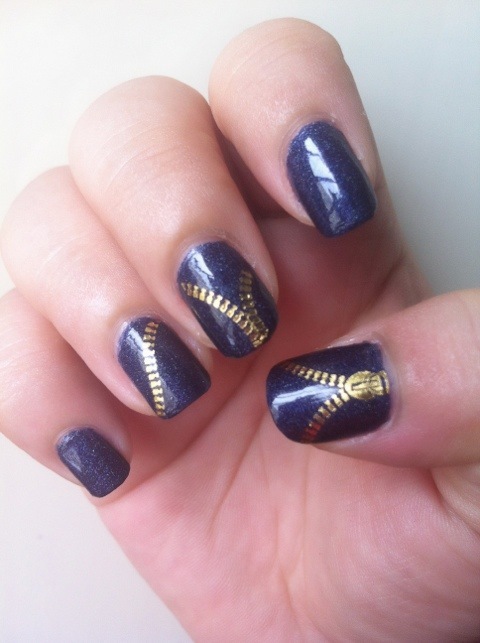 As i can’t wait to see the colors on my happy nails, i brush it on without base & top coat! I think this is the best photo that i can show u the colorful holo-ness.. probably i shd take a pic of it again when the sun is out.. but definitely not tomorrow.. cuz i’d already remove my polish.. >_< heee!! Below pic has VERY BAD resolution.. but good in a way is that, it can show u how it looks like from far when the holo/glittery effect is NOT CLEAR! and… did i mention? all these photos here are done with just one coat of Bridal Veil. Very opaque polish! save time from doing 2 coats. i’m loving my new Bridal Veil~~!! By request.. Ehem! Ehem! *thick skin* here comes my favorite A-England’s Tristam matching with The Golden Zip water decal!!! 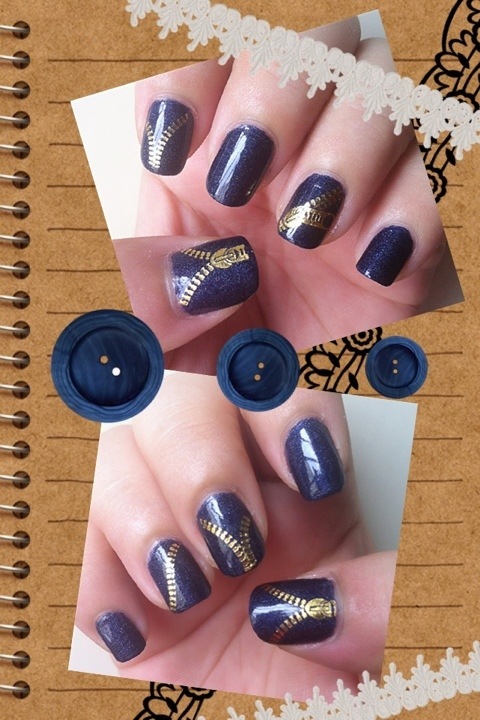 Above 2 pic are Tristam with The Golden Zip without top coat… Tristam is really a very classy blue with silver blue holo shimmer.. My boyf said it looks like granite (i think i mentioned this bef.. =P hahaha!) Tristam itself shines good..! 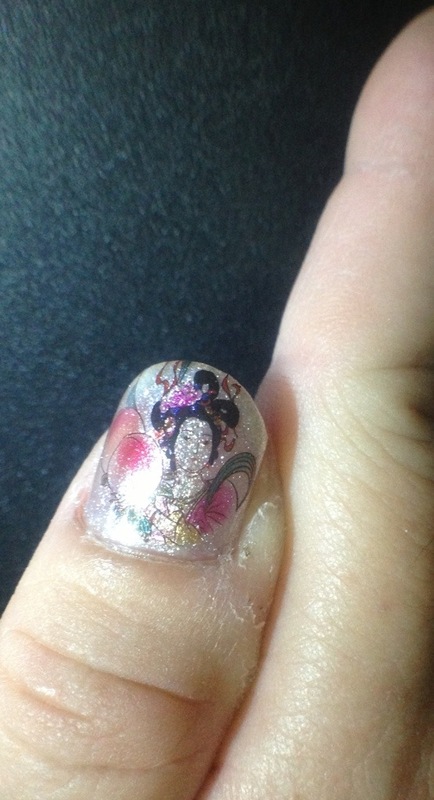 But because I added decal on it, it kinda lost 20% of its shine so it’s best to put on top coat!! To seal the decal and of cuz the polish color! Now that two (above) are sealed w Seche top coat.. My all time favorite top coat! 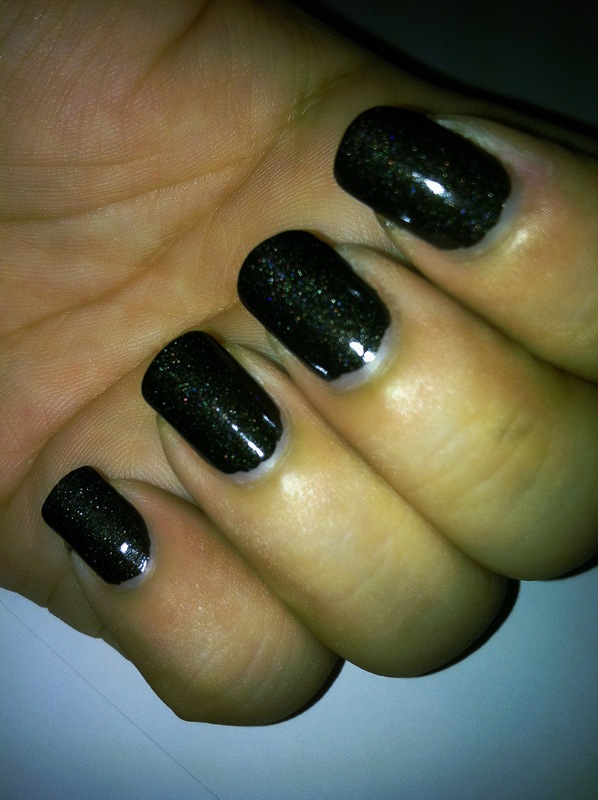 The best quick dry high shine top coat!!! Hope you guys will like this decal art tooo! To purchase any of what I just mentioned in this post, do visit Mei Mei’s Signature site HERE for more A-England, Seche and water decal!!! Saint George.. Zip it up! Once again i wana say.. A-England ROCKZ!!!! SMOOTH application! no clog no bald and high shine (tho my pic may not be very true abt this point)! 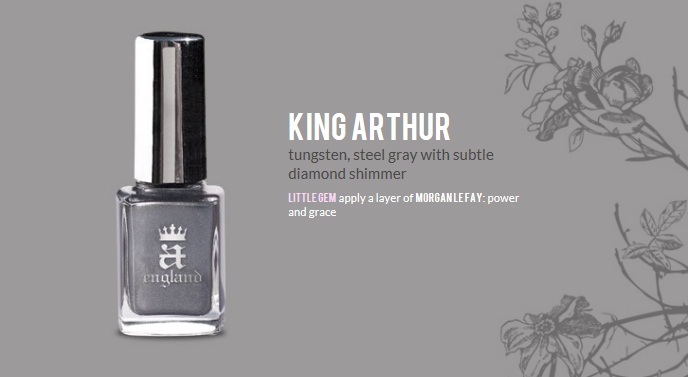 I really love A-England polish more than any other brand! For this i must thank Mei Mei’s Signature for bringing in such a good polish to share! 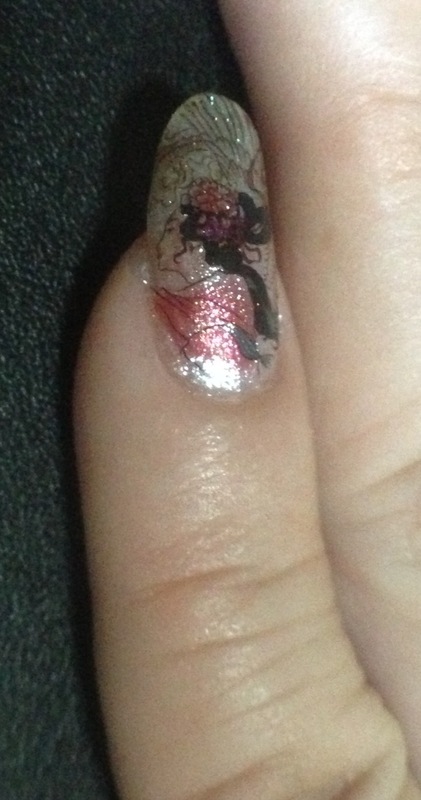 The above pic you see is only a one coat application of Saint George! !… YES! just ONE coat!! Very solid right!?? man! this is gorgeous!! I must admit.. due to my BIG OBSTRUCTION (tummy) i had a hard time taking good photo of it!! But nevertheless you can google it or u can click HERE to see Mei Mei’s upload..
Saint George.. a very gorgeous color.. 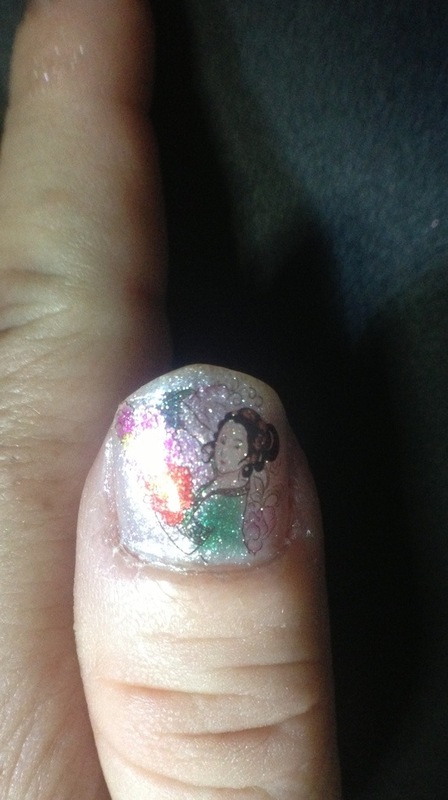 In short i would say its a holo-green polish. But to me “Holo” is sth like Nfu-oh, Glitter Girls, whr u can see rings of colorful holo.. but this one.. hmm.. probably a diff type of holo.. a holo shimmer perhaps?? LOL! doesn’t matter.. to me it’s be prettiest green i ever had.. a very opaque deep green with bits of blue & green & orange(?) shims.. Almost like Tristam.. You will like it if u love Tristam! Anyway, after im done w my polish, i started working on my water decal.. (Click HERE to see my previous post on how to use a water decal..) This time round i only applied water decal on my big toe.. the rest are too small to “zip” it up..